Our immersion program offers a daily routine of group meditation, Sanskrit study, Satsangs, Karma yoga, and Hatha yoga classes. An ashram is a place for students to learn and grow and think for themselves. It seeks to support a deep awareness and understanding of one’s self and the Universe. According to Sri Brahmananda Sarasvati, the founder of Yoga Society of San Francisco: “Ashram is the university of Nature. It does not only present the integration and unity of all sciences, cultures, philosophies, and environmental and ecological approaches, but it also encourages and provides opportunity for an independent way of thinking, meditation, and application. Ashram is not different from your own being and your own evolution. The piece of land and the buildings are not the reality of the Ashram, it is the person who is the Ashram. No doubt we have a name, building, and institution, but these are just the center where all kinds of blossoming for the individual are provided. Agnihotra ceremony and group meditation occur at the beginning and end of the day. All residents who are on the Ashram premises are required to be at the meditation. Residents are trained and encouraged to lead one Agnihotra a week as part of their study. The ceremony consists of chanting together followed by group meditation. The purpose of the ceremony is to bring healing, peace, and respectfulness to our world and ourselves. The Agnihotra is an ancient tradition to help practitioners meditate rarely found outside of India. The Satsang (weekday evening study) is a highly valuable element of the immersion program. Our current schedule includes one evening a week of chanting and discussing texts such as the Bhagavad Gita, Patañjali Yoga Sutras, and the Atma Bodha (Sanskrit for “self-knowledge,”). Two evenings a week we host kirtan (music) as an expression of bhakti (joyful) yoga. Many residents and practitioners find ending the day with Satsang is helpful to creating feelings of joy and tranquility. Shri Brahmananda often said: “We cannot change the mind, but we can change the contents of the mind”, and he firmly believed that learning Sanskrit was one of the ways to replace the negative contents of the mind with love and kindness. He also believed that a deep practice of meditation would help practitioners to simply fall in to the Sanskrit language. Karma yoga (the giving of yourself without expectation of reward, the manual labor of love, or… housework) is part of life that gives great benefit. There is incredible learning that takes place when one is responsible in keeping designated areas clean, organized, and beautiful for everyone to enjoy. 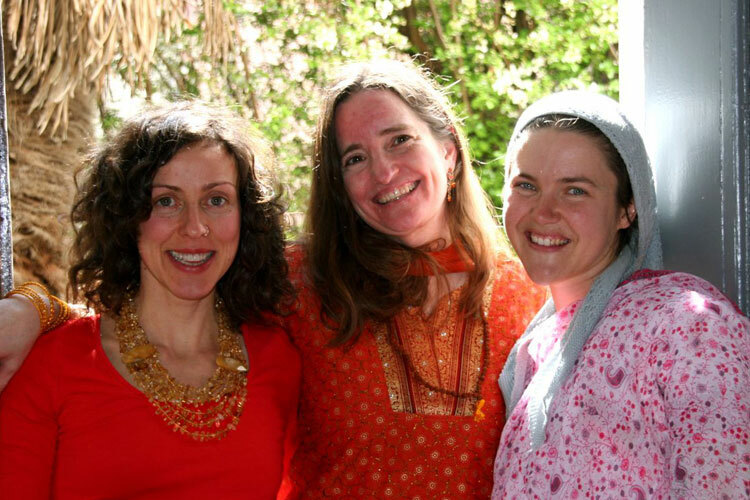 The yoga teachers at Brahmananda Ashram come from all walks of life, and each gives a slightly different flavor to the truth of individual practice. We host a spectrum of yoga classes to suit the needs of people of all levels and abilities. For people who are recovering from injury or are in need of deep relaxation we have Restorative, Iyengar, and Yin classes, for long-time practitioners who like to build prana and sweat we have Vinyasa, Flow, and Ashtanga yoga classes. Once a resident has been approved for the program, he or she is assigned a mentor and given that person’s contact information. The mentor is available for any questions or concerns about the resident’s experience while studying or the program in general. Mentors are people in the Yoga Society community who are familiar with the philosophy of the Vedas and Shri Brahmananda’s teachings, and who serve as guides for residents to process whatever comes up in the course of their intensive study. Resident meetings are a place of open communication where residents address the aspects of living together and collectively study Shri Brahmananda’s vision of ashram living. The weekly meetings help residents process the Ashram life, and to create a better experience of living together and in the world. 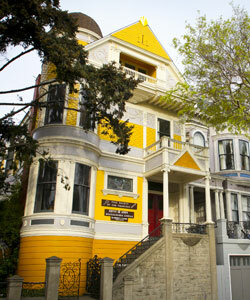 Yoga Society is located in the heart of the Mission district of San Francisco, California. When you step outside of the Ashram, you are immediately surrounded by a neighborhood of diversity, made up of a whole spectrum of ages and backgrounds of individuals and families. Therefore, what is unique about Brahmananda Ashram is that while it offers a daily routine, it also simultaneously invites you to participate in the outside world. Many of the residents have careers and engage in social lives outside the ashram. The residential program is designed for everyone to find a balance of how to bridge these two different worlds together. Tuition payment is $1,000 per month. It includes all classes, programs, room, and board, is payable upon move-in and at one-month increments throughout the residency period. Every resident must be a dues paying member of the Yoga Society of San Francisco. Some work-study opportunities are available. Students approved for residency must pay full tuition for the first month of the program, and will receive up to 25% tuition credit for the following month based on assigned work completed in the prior month. We highly encourage everyone to stay with us as a guest for a week before applying. If you are unable to stay as a guest please e-mail: yssfyoga@gmail.com to receive the application. Application process includes interview with the Ashrams Residency Committee. For applicants outside of the Bay area the interview may be conducted over the phone, please call: 415.285.5537.